A tribute to musician Vairamangalam S. Lakshminarayanan, who passed away recently at the age of 76. VAIRAMANGALAM S. Lakshminarayanan (`Vairamangalam,’ as he was popularly known), the foremost disciple of the late T. K Rangachary, established for himself a revered position in the music world. As a versatile musician, gifted with both `lakshana gnanam’ and `lakshiya gnanam,’ he could, with consummate ease, improvise and bring out the subtleties and nuances of ragas which call for expressions through meditative comprehension of their subtle promptings — ragas such as Nalinakanthi, Nayaki, Narayani, Kamalamanohari, Subapanthuvarali, Kalyanavasantham, Behag, Valaji, Ranjani, Natakapriya, Devamanohari, Nagaswarali, Dharmavathi, Janaranjani, Huseni, Poornachandrika, Andholika, etc. He would also, as a refreshing change, bring out in his concerts, the essence of certain vivaadi ragas such as Rasikapriya, Ganamoorthy, Neethimathi and Chandrajyoti. Inheriting truly the `padanthara’ and style of T.K. Rangachary, through `Gurukulavasam,’ Vairamangalam was also inspired and influenced by Ariyakkudi, GNB, Semmungudi and Rajarathnam Pillai. He was also motivated during his formative years by the classical tunes of M. K. Thyagaraja Bhagavathar and S. G. Kittappa, as also the outpourings of Dhandapani Desikar in the film, “Nandanar,” which he had the opportunity to see again, a few days before his death, after nearly 50 years. Vairamangalam would often recall, with nostalgia, particular presentations of the masters of yesteryear and also narrate how as a novice, he was once coaxed gently but effectively into swaram singing, for an Useni composition by Rajamanikkam Pillai, who while accompanying Rangachary in that concert, observed that he unexpectedly left it to his young disciple to continue the swara singing. This prompting of Rajamanikkam Pillai proved to be a major motivating incident in Vairamangalam’s career. Vairamangalam’s in-depth `swaragnanam’ was such that he could, as if he were an accompanist, keep pace by singing the corresponding swaras, simultaneously with a musician who rendered a raga. Though in possession of such scientific and `lakshana’ knowledge, he however felt `lakshiyam’ was highly important as this brings out the spirit of each raga through the process of grasping the essence of the `bhava’ and `sanchara pidis’ of that particular raga or melody. He would explain how great musicians such as Maharajapuram Vishwanatha Iyer, demonstrated the practical working of such concepts on concert platforms. As a person, Vairamangalam was not merely unassuming but also willing to involve himself, without any reservations, in what he himself referred to as `Vidhya Dhaanam’ — sharing and imparting knowledge. Not concerned with time occupation, he would passionately teach his students. Rarely was he concerned with awards or recognition and never went out of his way to win laurels or titles though many of these visited him as a natural sequence. 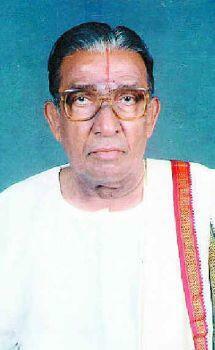 The `Kalaimamani’ Award of the Tamil Nadu Government was conferred on him a few months before his death. Other honours and awards from certain organisations were also received earlier, commencing with the sub-senior musician award of the Music Academy in 1971. The Department of Culture of the Government of India conferred on him, in 2000, the Senior Fellowship, for his project of setting to music about 65 verses from `Divya Prabandhams. His senior disciples Jaya Krishnan and T. Shyamsundar, as also all those who knew him, remember with fondness his greatness as a person, as a teacher and as a musician.